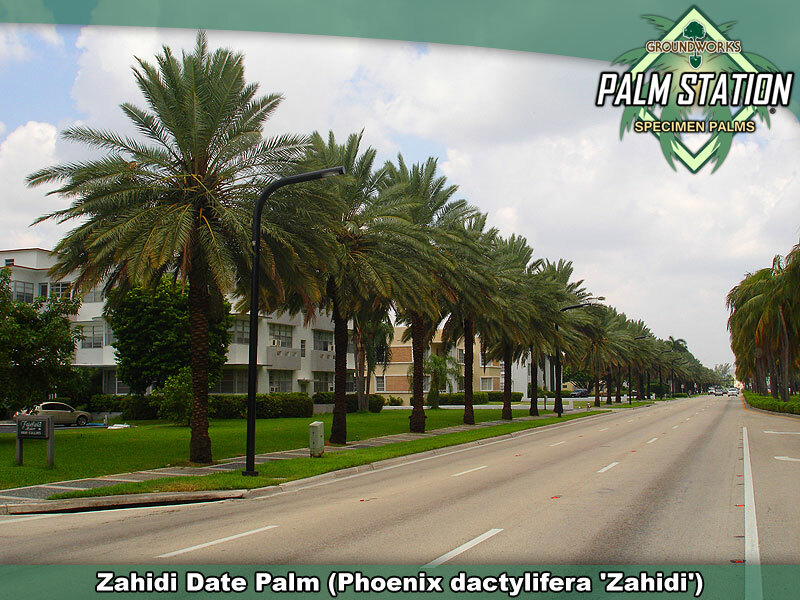 Zahidi dates have been successfully utilized in just about every possible application. In staggered groups, in rows lining avenues or as freestanding, very formal specimens, where Zahidis are installed, they tend to blow away everything else in sight. As natural attention getters, you cannot go wrong with these awesome specimens. 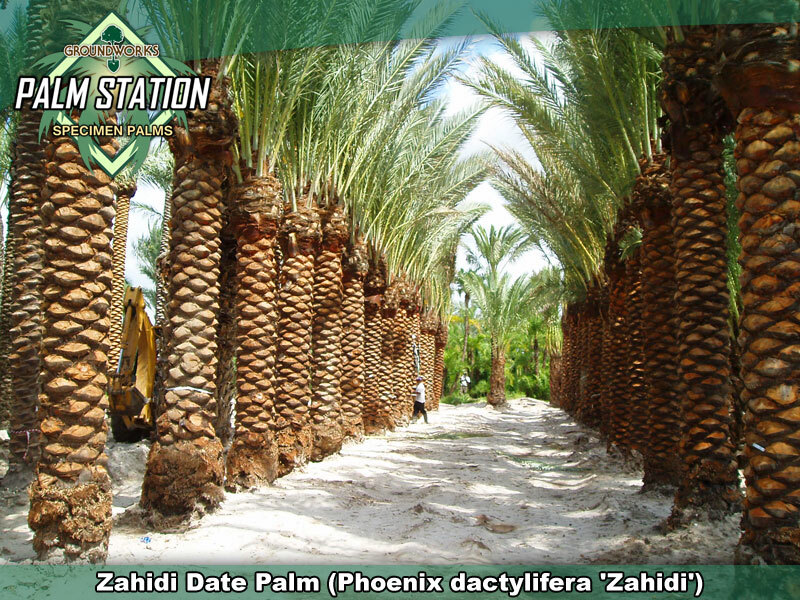 Zahidi dates bring impact and formality to every job site on which they are utilized. Zahidi canopies are much more upright in appearance then the Medjool and they tend to be slightly denser. Zahidi's are often specified where a look of organized formality is sought and where the client needs to create instant impact. Come to Groundworks and stand next to a Zahidi. Unless you just plain hate palm trees, your checkbook will be in your hand before you realize what is happening! Zahidi's can grow as tall as 70 feet and even taller in the desert. Like P. Canariensis, the growth rate is very slow and is slowed further by our wet conditions. 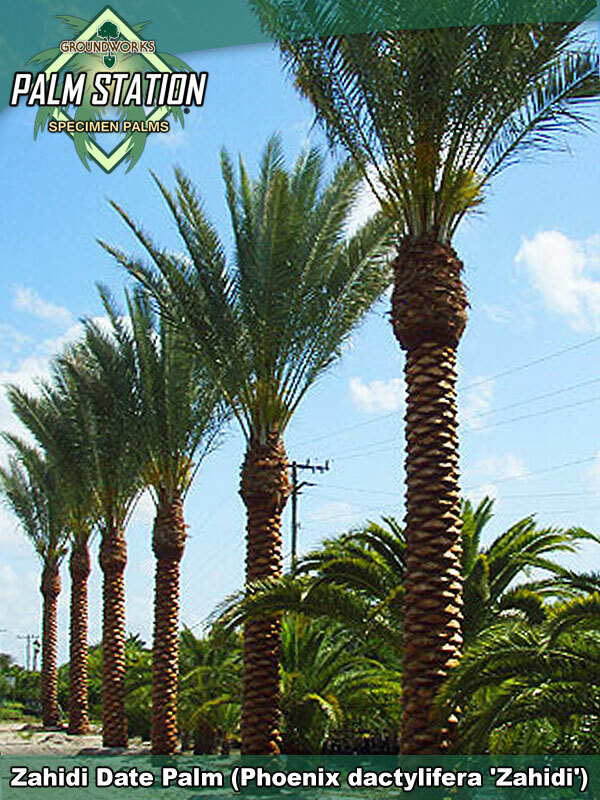 It is best to buy palms near or slightly below the size you need. After establishment, you can expect a foot of new trunk every two to four years. Commonly, the lower two feet of trunk has a layer of advantageous aerial roots covering it. These roots are normal and can be planted into the ground although most people prefer that we plant as high as possible as the palms are sold by size. The aerial roots are a part of the trunk and if you like, they are easily hidden with under plantings.